On Monday night, November 8th, the Lion's Den was the venue for the presentation of a proposed Sustainable Tourism Project for San Pedro. Facilitating the presentation was Mr. Pepe Garcia, Civil Sanitation Engineer privately hired to conduct the consultations by IE - International Environment - Architectural contractor contracted for this project. Along with him was Mr. Carlos Santos, responsible for the social and public consultation - acquire feedback and present to the relevant parties. The meeting involved a thirty minute presentation by Mr. Garcia, explaining the project, its benefits and the vision that he was hired to portray to the residents. Mr. Garcia further explained that his presentation is merely in its preliminary phase and that all input from the community will be heard and addressed. The preliminary concept includes a multipurpose pier development and sports field; a sunset boardwalk to be constructed along the lagoon waterfront stretching approximately 2,500 feet north and south along the shoreline from Caribeña St. to Tarpon St; lighting and trash receptacles, public open space, landscaping the area for beautification purpose, shaded seating areas and potential fish cleaning stands or fresh fish market. 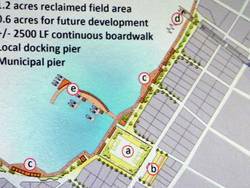 The Multipurpose Pier Development would stretch about 400 feet in length. It would include facilities for vending kiosks as well as retail structures. What is unique about this structure is that it would make the tourist's visit a more desirable one by providing facilities for customs, immigration and border management in one easy to access area which would also house a terminal for all water taxis. The construction of one strategically constructed public pier would include docking cleats and other facilities for existing and future private, fisher folk and tourism stakeholders. The Saca Chispas Sports Field would call for reclamation of the lagoon frontage to expand the field, allowing the permanent opening of the existing temporary street that crosses the field. This project would see the field being pulled further west ward, allowing for the street to go through and the existing area to the east of the street would be available for future projects. One suggestion for the use of that space is for a parking lot. According to Mr. Garcia, the preliminary benefits would include the creation of a new destination within San Pedro, consolidation of water travel to serve local and international travel; provide new opportunities for leisure and commerce; build public private partnerships for commercial and cultural growth, promote waterfront beautification, further the overall enhancement of San Pedro and increase the occurrence in overnight tourism visitation. The Belize Sustainable Tourism Project in San Pedro would include five major components. At the end of the presentation, it was explained that there are currently no designs have been drawn for this project as it is just in its consultation phase. The floor was then opened for attendees to stress their concerns. As with many projects that have recently surfaced, the concept was met with much disapproval. Among the concerns expressed by the attendees were, the environmental impact that this project would have on the existing breeding grounds that exist in that area of the lagoon; the potential destruction of the cultural and historical significance that the parcel of water front represents for San Pedro among other concerns. All concerns were duly noted and the group was assured that their concerns will be addressed. The meeting was attended by some members of the community, mainly individuals that reside in the immediate area that would be affected by the project, members from the business community, hoteliers and members of the media.